An angiogram is, by definition, a picture of a vessel, most commonly a blood vessel. 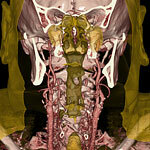 A CTA creates images of the arteries and veins in virtually any part of the body. This allows the radiologist to check for abnormalities such as narrowing, vessel wall damage such as aneurysms (ballooning of a portion of a vessel wall that can cause a rupture), embolisms (traveling blood clots) and dissection (the peeling away of an arterial wall). The term coronary CTA refers to an angiography of the arteries supplying the heart and is further covered in the cardiology section. CTAs are always performed using contrast dye, so please consult the section on preparing for contrast CT scans before you schedule an appointment. The iodine based contrast material is injected intravenously and then the images are taken. The dye adheres to certain types of tissue, highlighting it for superior image quality. The dye will leave the system within 24 hours as long as you drink plenty of water after the injection to flush it from the kidneys. Patients are screened for proper kidney function prior to getting the injection.